This super simple and easy homemade italian dressing mix is so tasty and so simple that you will never buy store bought dressing again! 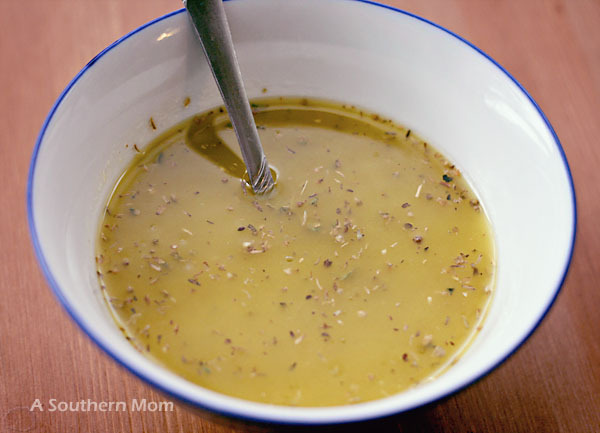 You can keep this italian dressing mix in your pantry and whip up fresh italian dressing whenever you want! I recently made a recipe that required Italian dressing. A quick scan of the pantry and fridge turned out to be pointless. I called a friend for her recipe hoping I had all the spices needed. She gave me her homemade Italian dressing recipe and I scanned my spice cabinet as she read off the list of ingredients. I had everything I needed. This dressing is TASTY! It tastes even better after it's had some time in the fridge. NOTE: It's a teensy bit salty. I like that, but you might not. Use a bit less salt if you aren't a fan of salty stuff! 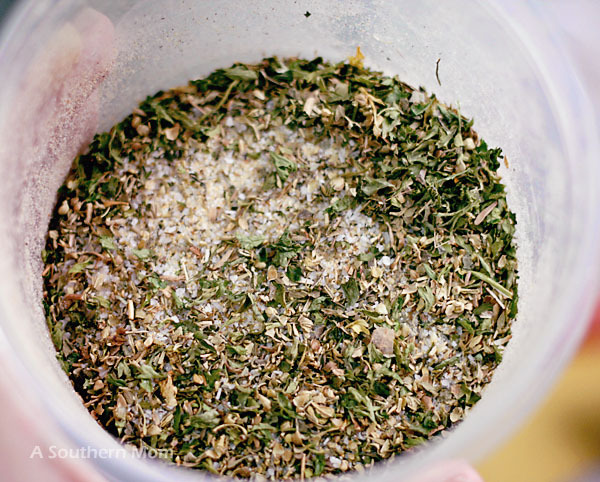 Mix all the ingredients together and shake it up in an airtight container. To make the dressing, pour 1/4 cup white vinegar, 2/3 cup olive oil and 2 tablespoons of water together in a container. Whisk in 2 tablespoons of your mix. Store in the fridge. My friend uses canola oil for her Italian Dressing, but I prefer cold pressed olive oil. 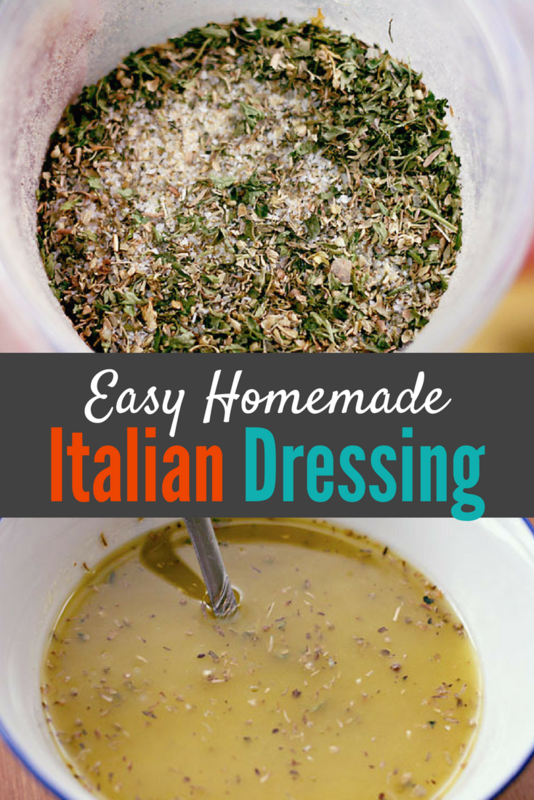 If you enjoyed this Italian Dressing Recipe please share it on Pinterest and Facebook! Wow! I also happen to have all these spices in my pantry, so I will definitely try this to dress a salad or in a chicken skillet recipe. Do you know how long can I keep it without it going bad? Does it last like a bought dressing, because of the vinegar? Hi! I love this sauce but I’ve always used the bought one. Having said this, I’m looking forward to try it! However, I’d like to ask you how long do you keep in the fridge? Thank you! This looks like exactly what I was looking for! How long will it keep in the fridge? I usually make it up as we use it. So I would say probably a few days, but I have not tried it longer than a day or so. Oil will solidify in the fridge as a rule. Set it out on the counter for about 30 minutes and shake shake shake! It’s fine. Enjoy it! Couldn’t you just omit the water and then not have to worry about this going bad? Mixed this up this week and I am so pleased! What a great spice blend! I am going to mention it in a post if that is okay with you? I will link back to your page! on your next publish, I will try to get the cling of it! Homemade Cream of Chicken Soup Recipe - You Can Ditch the Can! From Scratch Chicken and Dumplings- Simple and Delicious Comfort Food! Easy Muffin Recipe - Simple, Quick & Prepped The Night Before! Enchilada Casserole - Easy & Quick! Halloween Bark: Leftover Halloween Candy? Make This!